We’ve all worked jobs that we weren’t exactly in love with. Whether it was the environment, the industry, our coworkers, or simply personal preference, finding a job that not only provides a good paycheck, but is fulfilling, is an important step towards finding happiness and avoiding unnecessary burnout. 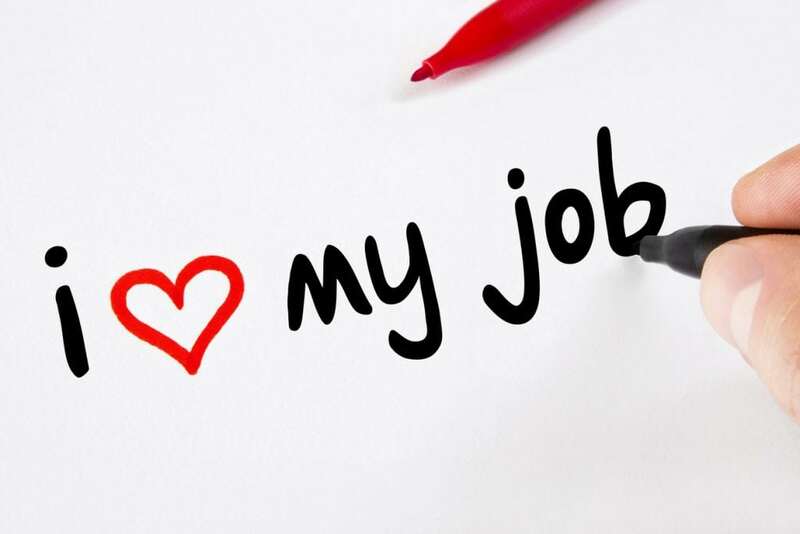 I’m sure you’ve asked yourself, “How do I find a job that I love?” Here are 6 tips to help you find a career that you are excited to wake up to! Jobs without the ability to move up (or at least around) within an industry can be frustrating for those with ambition. It depends on the job, but if you are finding yourself doing the exact same task every day, expect it to get old fast. Most people equate success with progress and upward mobility. One sign that you are in a dead-end job is that your coworkers who started before you still remain in entry-level positions. Ask your coworkers, “Are promotions offered regularly for strong performance?” Unless there are obvious reasons why these people have gotten themselves stuck, you may be in a dead-end job. Nothing creates more stress than financial problems. We all know that it can derail your personal relationships, but it can also derail your career goals. Many financial issues can be avoided by making thoughtful and prudent decisions. This approach may allow you to eventually pursue work that may be slightly less lucrative (at first), but is a great fit with your personality and could be enormously rewarding to you in terms of purpose and meaning. Take an inventory of your life’s expenses. Are you wasting money unnecessarily? Do you have credit debt that is killing your finances? Are you in an apartment or car that you can’t really afford? Create a budget and make real weekly and monthly progress in eliminating cost streams that are handicapping your life and career progress. It may feel corny, but there are a ton of experts out there, like Suze Orman, doling out free financial advice that can help you get on a better track. Take advantage. Once these financial constraints are removed, you will have the freedom to take your ideal job and pursue a career that is going to let you feel like you had a life worth living. It may take some soul-searching to determine how your current position really affects your life. For instance, a person who prefers to be a “night owl” may find that their current 7am – 3pm job is a poor fit with how they would like to live. Conversely, an early-riser may find that a swing shift interferes with his or her sleep patterns. Can you handle the workload, or would you find your health and well-being slipping to the demands of the position? As a rule of thumb, look at the health of your coworkers who have been employed at the company for a long time. Do they suffer from common injuries, like back pain, carpal tunnel syndrome, or obesity, which can affect your personal life? Hopefully, we will all live long lives. Be sure to think about how your work will positively or negatively impact your life now and over the long term. If your work allows you to be healthy and well, you may just love it. Self-satisfaction often comes through developing an expertise in your field. In general, it is to your benefit if you can find a career path, where you can remain and progressively move up the ladder. With the landscape of occupations changing daily, many careers that were guaranteed for life don’t have that same sustainability in our modern world. If it’s “only a matter of time” before the industry you are considering goes south or is phased out, it may be better to jump ship now and find a career that has longevity. You’ve probably heard the phrase, “don’t combine business and pleasure.” Or on the other hand, we have also been told to “do what you love and you’ll never work a day in your life.” Aren’t they a contradiction? What’s one to do? The answer is to “know yourself.” What kind of work makes you feel good? Within your past jobs or hobbies, what are you especially good at? Each of us has talents, and there is no question that you will live a life more satisfied if you are doing work that you excel at. Careers are more competitive than ever and having a skill set that allows you to rise above your fellow employees is a gift that you should take advantage of. If you don’t know yourself, ask your mother. She knows you. Ask your friends, coach, priest, bartender, etc. Do what it takes to do a full skill and emotional assessment of yourself. It will provide you with the compass to navigate towards work that fits you. Think about your last job. Did it make you happy? Did it make you lose sleep? Some career paths have elements that seem unethical to some people. How do you feel about your industry, and how does it inform where you belong? For our final tip, we have a word of caution. It’s not enough to look over someone else’s shoulder and decide that you wish you had their career. To really know if you belong in that career you must pursue it, and the first step in pursuing is not quitting your job. It’s doing research. Go out and talk to as many people as you can about that type of work. Could you see yourself doing the work? Do you have the natural talents they have in terms of coordination, communication, analytics, etc? Ask them about what they love and hate about the job? Find out what track you would need to pursue to get into that work. Can you see yourself making that commitment? It’s sometimes not easy starting from scratch. Is it possible to leverage the work you have already done to merge into another industry? These are all important considerations. The last things you want is to make an enormous change that is not actually right for you. That change will not only leave you unsatisfied and not doing something you love, but it may also do some harm to your resume.